When I learned that Marlene Englander (Jack Saul’s daughter) and her husband Jon would be visiting us on Feb. 28, 2011 I couldn’t have been more excited. Marlene had been very helpful to the Recorded Sound Archives in negotiating the details of the delivery of two large truckloads of audio recordings from her mother’s home in Cleveland to FAU Libraries. As a matter of fact, it was this enormous gift of recordings from the Saul family that inspired FAU Libraries to create the Recorded Sound Archives (RSA). Over the past six years the Judaica Sound Archives has been gaining in prominence and size. So you can imagine the excitement when we started unpacking the Saul Collection and found hundreds of gems that were new the JSA collection. Since Jack Saul had a wonderful collection of early Victor recordings we were able to put together collections of music by such Jewish entertainment super-stars as Al Jolson, Jascha Heifetz, Efrem Zimbalist and Alma Gluck. FAU Libraries’ large collection of Jazz recordings did not fit within the parameters of the JSA and had been sitting dormant on the shelves at Wimberly Library. This new addition of more than 50,000 non-Jewish 78rpm recordings of classical, popular and folk music as well as historic speeches were also inappropriate for the JSA. Luckily, we were in a position to apply what we had learned processing Jewish recordings to these other music treasures. Creating a more comprehensive Recorded Sound Archives just seemed like the logical thing to do. We gave Marlene and Jon a tour of the new RSA’s three separate areas: Judaica, Jazz and Vintage 78’s. “How much of this came from my father?” she asked looking down a long aisle of records. “Just about all of them,” I replied. I was especially pleased to be able to show Marlene the recognition “gold record” that had been placed on our Sound Angels wall and to present her with a similar plaque to take home to her mother. Not long ago I received the following email from Marlene. I am proud to share it with you. “What a pleasure it was to … see the fabulous things you are doing with both the Recorded Sound Archives in general and the Jack Saul collection in particular. Our family is so pleased with the dedication and devotion of your staff and volunteers in working to provide access to this unique resource. [We] were pleased to see familiar faces – you, Ben, Alethea, Dean William Miller and Associate Dean Rita Pellen – and to meet a volunteer who was so excited to have found a signed 78 recording from the collection while we there! Upon returning home, I couldn’t wait to show my mother some of the pictures, and she, of course, was very pleased. 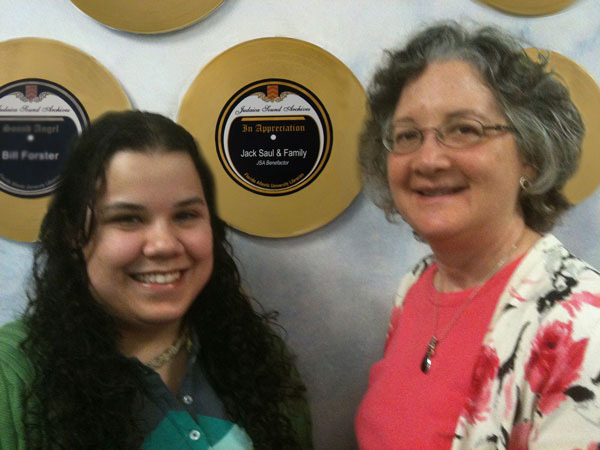 She also was touched by the plaque you had made for her and to see that our family’s name is now on your donor wall. I hope she will join us on our next trip – the way the weather is up here, it may be sooner than anticipated!